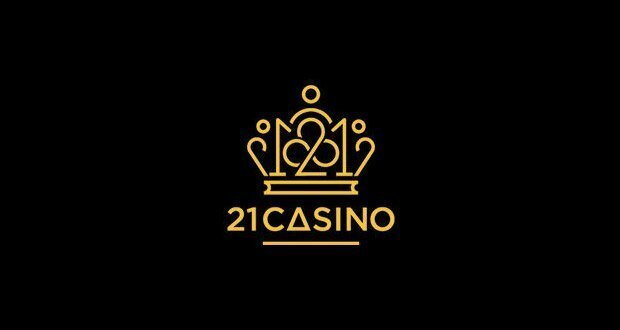 21 Casino is a UK and worldwide online casino, and one which offers a rather luxurious looking domain with which you can play your favourite casino games. 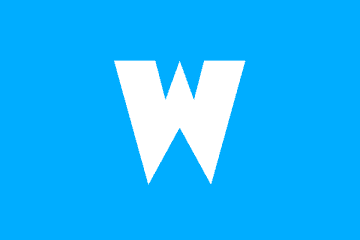 The site debuted in 2015 and is owned and operated by White Hat Gaming Limited. Other casinos from the same owner are Casilando and Fruity Casa. The online casino site is licensed out of Malta, Curacao and the United Kingdom. 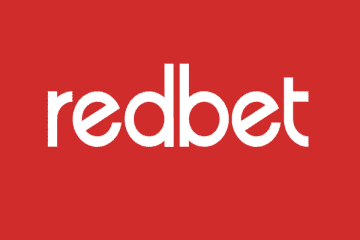 , It offers multilingual casino gaming to the masses. Live, instant play and mobile casino gaming are offered by 21 Casino. Allowing customers to play how they see fit across multiple platforms. If this all sounds appealing to you, you can try your hand at their games by becoming a new member today. The casino offers a 121% casino bonus worth up to £300 when you deposit and play with them. 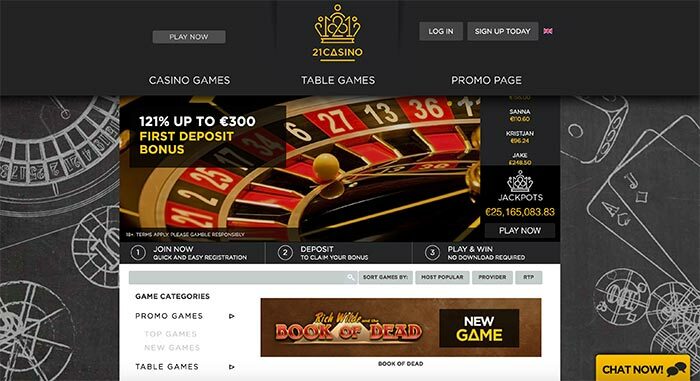 Why Play at 21 Casino Online? Games are plentiful at 21 Casino. There is something for everyone to get to grips with. A host of top casino software providers offer their games at the site. These include 1×2 Gaming, 2By2 Games, Bally, Barcrest, BetDigital, Big Time Gaming (BTG), Blueprint Gaming, Concept Gaming, ELK Studios, Evolution Gaming, Felt Games, Foxium, Games Warehouse, Genesis Gaming, Inspired Games, Just for the Win, Leander, Lightning Box Studios, Merkur Gaming, Microgaming, Net Entertainment, NYX Interactive, Quickspin, Rabcat, Realistic Games, Red Tiger Gaming, Scientific Games, StakeLogic, Thunderkick, WMS Gaming and over a dozen smaller-scale software providers. From the lobby, players can choose from a vast number of gaming genres to suit their needs. Games can be sorted by the software provider, popularity, RTP rates, or categories. Those categories include promo games, table games, slots, jackpot slots, live dealers and other games. You can also search for a particular game via the search box provided. Top table games include roulette, blackjack, table poker and live casino versions of most of those titles, provided by Evolution Gaming. Of course, online slots tend to be the most popular games you will find at the casino site. The leading slots housed at the casino include Rich Wilde and the Book of Dead, Starburst, Jungle Spirit: Call of the Wild, Sparks, Jack and the Beanstalk, Bonanza, Dead or Alive, Gonzo’s Quest, Immortal Romance, Reactoonz, Ted, Raging Rhino, Jumanji, Guns ‘N’ Roses, Piggy Riches, Secret of the Stones, Warlords: Crystals of Power, Asgardian Stones, Montezuma, Planet of the Apes, and the Hotline slot. Leading progressive such as Mega Fortune, Mega Moolah, Divine Fortune, Major Millions, Hall of Gods and Arabian Nights can also be played at the casino. Whether you fancy yourself as something of a high-roller or are more interested in keeping a tight grasp on the purse strings. You will surely find something to your liking at 21 Casino. As mentioned, 21 Casino can also be played on your favourite mobile gaming devices, such as smartphones and tablets. It is worth noting that 21 Casino offers the same bonuses and promotions for their mobile players as they do at their online casino site. As for mobile games, not all the titles you can find in the instant play (browser-based) online casino site are available via the mobile platform, though most of them are. 21 Casino also offers live dealer games via its mobile platform, which is both iOS and Android-friendly. The mobile platform at 21 Casino does not require players to download an app. It runs straight out of the box on your phone or tablet’s browser. This allows players to obtain access to mobile gains rapidly with no fuss whatsoever. Should you find yourself needing a touch of assistance, the customer support team at 21 Casino are on hand to help. Customer support is available around the clock, on a 24/7 basis. One of the ways you can get in touch with the support team at 21 Casino is via e-mail. Alternatively, the casino has also provided a rather in-depth FAQ (frequently asked questions) guide so you can rapidly get answers yourself to the simpler, more commonly asked questions at the site. Live chat is also available if you need fast and speedy responses. As mentioned, this casino features licenses from three of the biggest licensing jurisdictions in the world. They are legally allowed to offer English, German, Finnish, Norwegian and Swedish language casino gaming to players across the globe, with licenses issued out of Curacao, Malta and the United Kingdom. The online casino also publishes the RTP (return to player) rates of their games, so players should be in no doubt that fair play policies are being adhered to at this well-regulated and audited casino site. Banking options at 21 Casino include VISA, MasterCard, Maestro, Skrill, Neteller, Bank Wire, Sofort, Paysafecard, and Trustly. Not all the above options are going to be available for withdrawals. Players can use those options to deposit into their accounts using British pounds sterling, US dollars, euros, or Swedish kronor. Deposits are free of charge, and withdrawals should be, too. Players may experience waits of 24 hours for e-wallet withdrawals and between 2-5 days for credit card withdrawals. This is still extremely fast when compared to their rivals, though. The casino does feature withdrawal caps. But they are suitably high enough to ensure that they won’t bother too many players. Any new player who chooses to sign up and play at 21 Casino is entitled to claim a welcome bonus. A 121% match deposit bonus on their very first deposit. This offer is worth up to £300. As well as the welcome bonus, the casino also provides 21% matches on your first deposit of the day. This is on Mondays and Tuesdays each week. This little bonus is worth up to £210 a pop. 21 Casino regularly offers Stairway Bonuses, which promises free spins when you deposit over the weekends. There is a loyalty bonus program you can join, too. The latter offers players points based on their wagers.Those points can be used to redeem real money and other goodies at the casino.